Travel Vests - Side 1 of the travel vest shown on the home page has pockets with velcro closures. 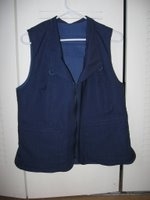 Side 2 of the Vest (shown at left) has zippered pockets for security. 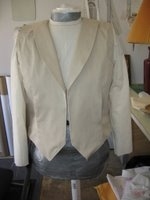 The collar can be worn on either side, tucked under for a collarless look, or buttoned high to close out the wind. A large back pocket on both Side 1 and Side 2 gives the perfect location to carry a water bottle, maps, or a secure place for valuables if stored in the pocket worn on the inside. The vest can substitute for a daypack. 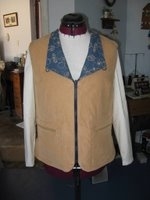 A woman's vest with an interesting edge finish on the pocket flaps. The edge is formed by the selvage which gives the impression of a narrow fringe along the pocket flap edge. This vest has a total of 13 pockets including custom pockets for a cell phone, a loop to hold sunglasses, and a shoulder epaulet for securing a camera or purse strap to the shoulder. 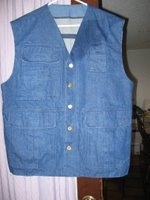 A denim vest for a man with custom pockets for cell phone, chewing gum, small notebook, pen, pencil and 4 interior zippered pockets for security. Metallic buttons hold the front securely closed or a small loop and snap hold the vest at the front but provide for ventilation. 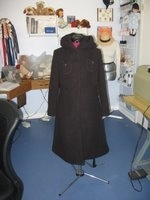 Side 1 with collar and hand warmer pockets in the front as well as a hidden pocket for credit card or cell phone. Side 2 without collar has two hidden zipper pockets. 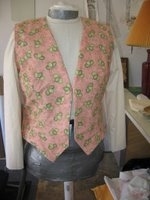 This vest crossed the Atlantic for a visit to the Emerald Isle. My mother said the vest was a bit heavy with all of the pockets loaded but her hands were free and she traveled with only one checked bag which made light work of several plane changes. 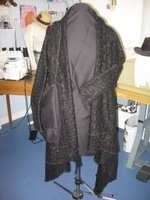 A light "Sweater Wrap" - a shawl with sleeves is perfect item for the airplane or to wear under air conditioning in movie theaters or halls, or over a formal strapless or small strap dress that leaves the shoulders and neck uncovered. 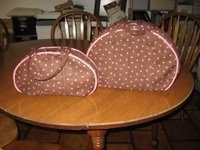 Mother-daughter carry-on bags for a weekend trip or a shopping daytrip. A bridesmaid's dress worn for a wedding in the 70's provides the material for a gift at the bride's 35th wedding anniversary. 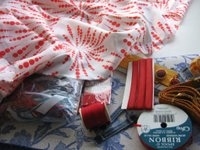 The little bear is made from the fabric of the dress and uses lace from the dress hem and sleeve. A sweet way to keep memories of a special day close and touchable. 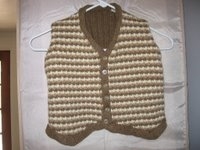 Great Grandma left this little vest unfinished in her knitting basket. 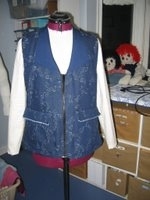 Sew Klassic completed the vest and added buttons. 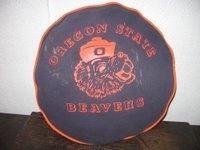 A special treasure to add to the family trunk and be worn by great grandchildren and beyond. Another special bear made from Great Grandmother's clothing and a wool blanket that was used for family outings at church camp. A huggable memory saver. 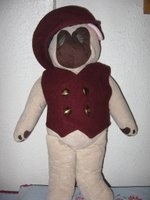 Buttons for the bear's eyes and vest are from Great Grandmother's sewing basket. 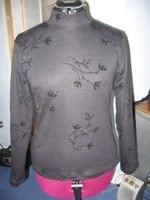 An unusual knit with velvet applique creates a one-of-a-kind mock turtleneck to add to your wardrobe. 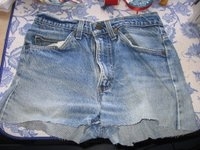 What to do with a pair of worn out cut-off jeans? 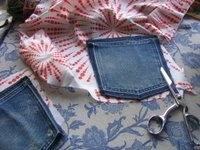 Begin by taking the jeans apart at the seams and saving all of the elements. 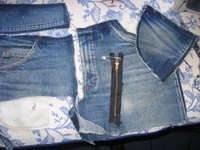 Pockets, belt loops, waistband and zipper can be reused. ........ and something like this can be the result. 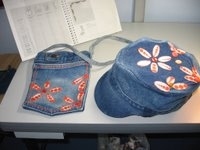 Our grandson calls this denim tote bag with pockets for books, stuffed animal and a fleece blanket, his "bedtime bundle". 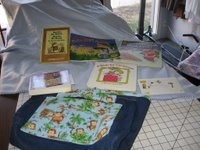 The books are purchases from the local library book sale and have been added to with fabric, scrapbook paper, colored pencils and pens, paper pockets and puppets. 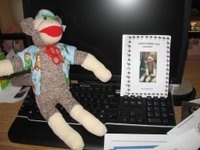 Named by our grandson, Terence, the sock monkey, is one of the "luvies" that fit in the bedtime bundle along with a book that tells how grandma used a sock from the sewing basket to create Terence and some adventures that Terence has as he waits to meet our grandson. 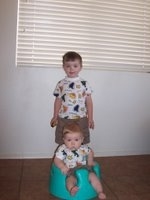 Grandsons and brothers in matching outfits. 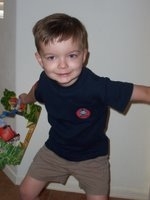 Dinosaur shirts and cargo shorts for summer fun. 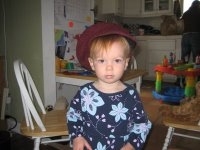 Our granddaughter gets equal billing. Here she is bringing a book to a bear to read and wearing bear's hat. Bear is the one that appears above. 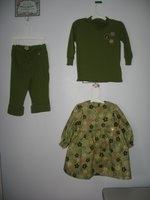 His clothes are sewn from great grandmother's wool camp blanket. 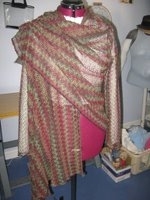 Gold metallic threads run through this black knit fabric. The bag over the right shoulder is a storage and carry bag for the wrap. A warm, yet elegant Sweater Wrap is just the ticket for a night out in a little black dress. The bridal gown was so lovely with heavy beading on the bodice and small satin straps over the shoulders, yet, how could the bride avoid getting a chill at the wedding held in a ski lodge at over 7000 ft on an rainy evening in October? 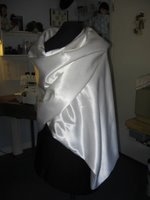 A wrap with satin on the outside and soft plush cotton on the inside was the answer. Retro coat in Black Fleece - Who would have guessed that saving that favorite pattern from the 70's would come in very handy.